Hey, now this is exciting! I’m currently in Croydon, a suburb south of London, where I’ve been for about 3 weeks. 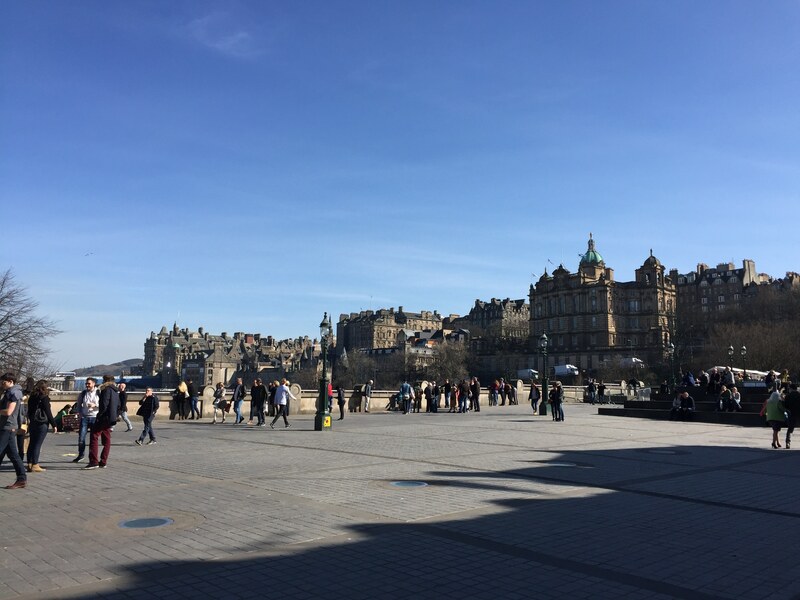 And with this entry on Edinburgh, I’m finally catching my travel blog back up nearly to current time. Yaaaaay! See, the trick is, compress 4 months worth of time into a single blog entry! I should have thought of this ages ago. All you have to do is go back to a place that you’ve been to and written about before, and then stay there for 4 months and don’t see anything new. Write the blog entry for it just as you leave… profit! From now on, all of my stays will be for 4 months at a time. So, which of my friends wants to be first when I go back to the States and do my U.S. tour next year? No, wait, that’s not fair… I shouldn’t make you guys fight over it. I’ll set up a separate page with an automatic lottery, and you can all draw numbers, and whichever person draws the number closest to the one I’m thinking of right now will have the pleasure of my company for 4 uninterrupted months! That seems the fairest way to go about it. I’ll set that up shortly and let you know when it’s done. In the meantime, on to the topic at hand: Edinburgh. 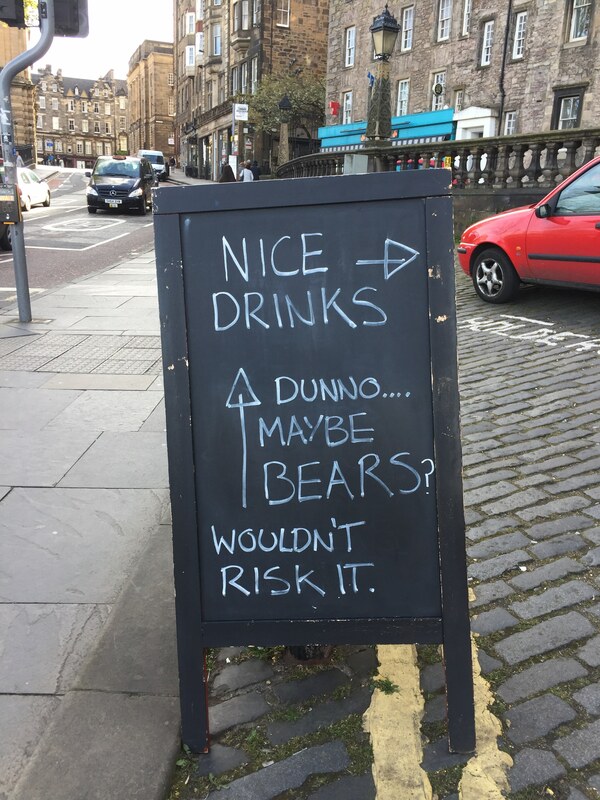 I was in Edinburgh from March 17th — which I discovered (at my favorite local pub, to which I had made a beeline after dropping off my bags) to be Saint Patrick’s Day, so yaay that. (I don’t mean that I didn’t know 3/17 was St Pat’s day, but I hadn’t been thinking about it and was mildly surprised to find it suddenly upon me.) And I left Edinburgh on July 17th, 3 weeks ago. I was considering writing this entry before I left Edinburgh, but then the digital game store Steam had a summer sale, and I got all of the Fallout games before the current Fallout 4 (Fallout; Fallout 2; Fallout 3; and Fallout New Vegas; and all of their additional content) for about $24. So I bought them, and was playing the original Fallout, from 1997, for my last couple of weeks in Edinburgh (preempting most of my work on this entry). It’s a kind of odd game to play, but surprisingly decent for a 20 year old game. BTW, I just ran into this bit on Twitter, and it seems apt here. Not that anyone here was complaining — nor should they, given the atypical interests of all of my friends. Indeed, having atypical interests is very nearly a requirement for me to like someone. But it’s beautifully stated, and is a sentiment that I find that all of the best people share. Anyway, it’s for the best that I didn’t finish this until I left Edinburgh. After all, the point is to have a single blog entry for my entire stay; I can’t do that if I publish it before I leave, now can I? Thankfully, this is not the impossible task that it might seem because, as you’ll doubtless recall, I’ve been here before. In fact, I’ve been here 3 times in the last year (and once before that, long ago, but that hardly counts). The first time was for 8 days in May 2016 (as seen in 3 posts, starting here), and, because of having to wait at home for 2-½ days for a FedEx package that had insane delivery problems, I didn’t really feel like I’d been here properly. 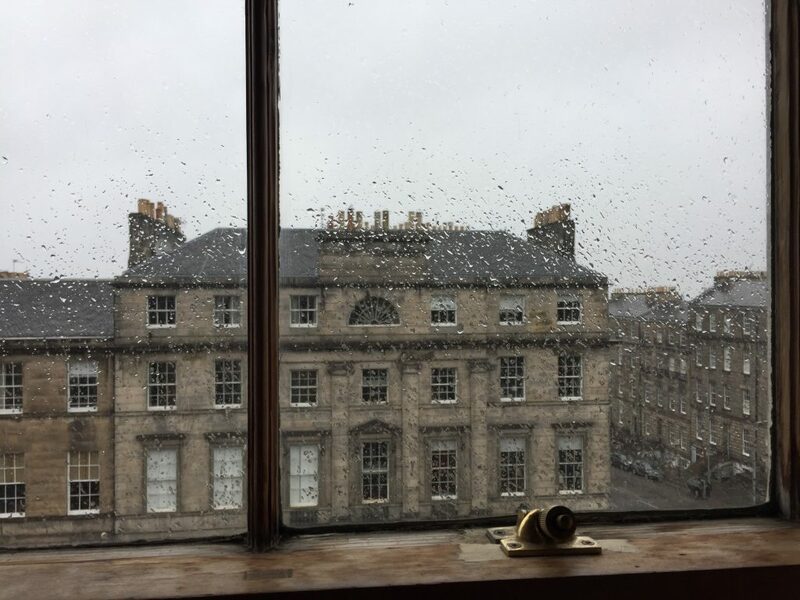 So, after going on to Ireland for the summer, I decided to go back (instead of going on to Berlin), so I spent my fall in Scotland with a month in Glasgow and 6 weeks in Edinburgh, before flying home for the winter (via Dublin). I never did write up my fall time on the blog. I may go back and do those during my down time back in the States in November — Glasgow deserves treatment, at least. 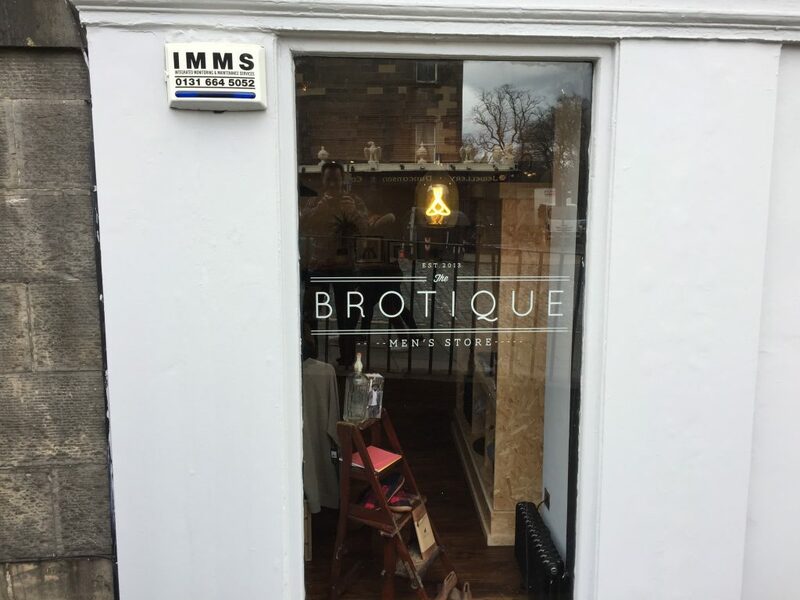 But the long and the short of it is: most of the cool stuff in Edinburgh is largely described in those earlier posts, and my return trips have mostly just been enjoying those things more. But I’ll see what I can rustle up for you. So, my flight into Edinburgh (from Barcelona) was meant to arrive at about 12:30, and ended up closer to 1:00, but other than having to send my host a couple of extra messages, that was no big deal. Murphy wasn’t at home anyway, he was a few blocks away in a garden plot, weeding, and there was a keybox for letting myself in. 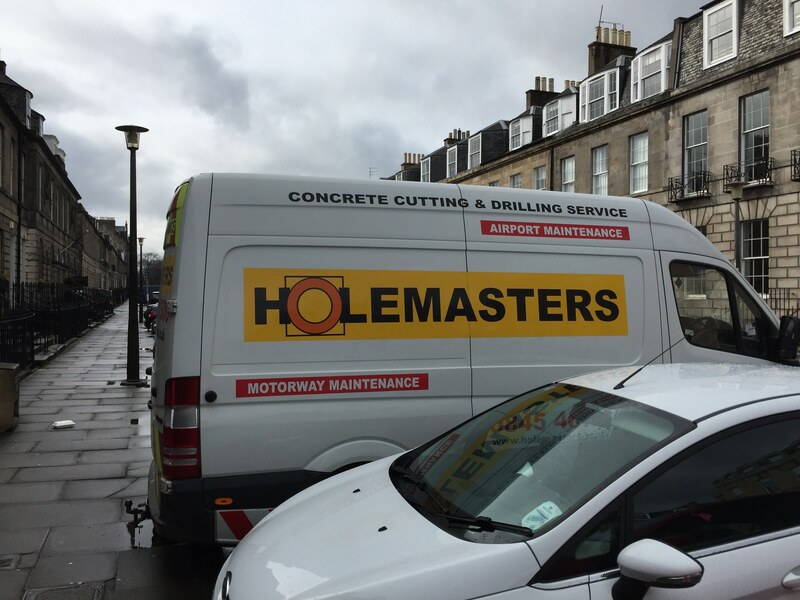 I’m not sure how one gets garden plots in Edinburgh, but there are a variety of places that the local council makes available to local residents — gated parks and whatnot — and this probably was part of such an arrangement. Edinburgh seemed largely divided in what were effectively multi-block condominium complexes, where you own your unit, but you still pay fees for “the commons”, and they, in turn, take care of all matters outside of the walls of your unit, even to changing the light bulbs in your building stairwell. It seems like a very agreeable way to divide a city into smaller, more manageable bits. After dropping my bags off, I went to my favorite Edinburgh pub, Brewdog, and had their yummy goat cheese pizza and a new beer they’d just released that day, the Semi-Skimmed Occultist, which they had on tap. My gods, that’s a good stout. Brewdog is a recent Scottish brewery known for their eccentricity, and for their sometimes insanely strong beers. 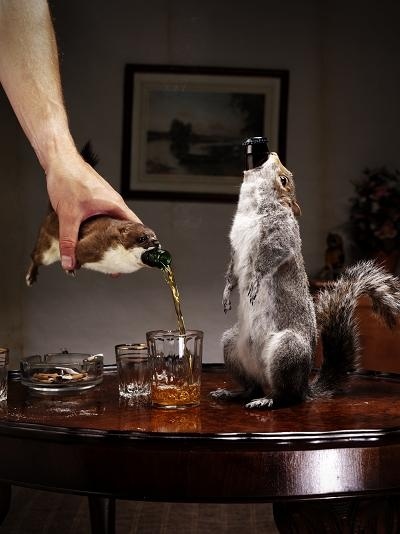 They once made a beer that was 55% ABV (the percentage of Alcohol, by Volume, in the drink), called End of History, that came contained in a taxidermied animal. I love this with every fiber of my being. For comparison, a typical Guinness is about 4.3%. Most yeast starts to die by around 15%, and some strains make it to 25%; to get higher, I think you have to use special techniques like freezing the beer and removing the separated-out water ice, to increase the relative percentage of alcohol. 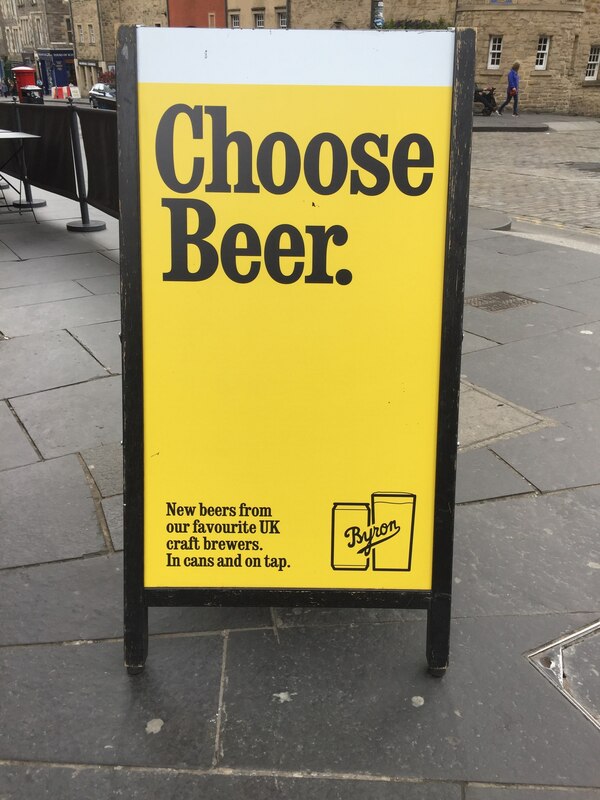 As I recall, a British temperance group made vocal complaints about the strength of Brewdog’s beers, on the principle that it encouraged irresponsible drinking. So Brewdog responded by making one that was 0.5% ABV, and called it “Nanny State”. The group, I heard, was not amused by being so roundly mocked — but Brewdog still makes Nanny State. I ordered it once in Glasgow, because I *had* to try it — and I still remember the withering look of the bartender when I made my selection. 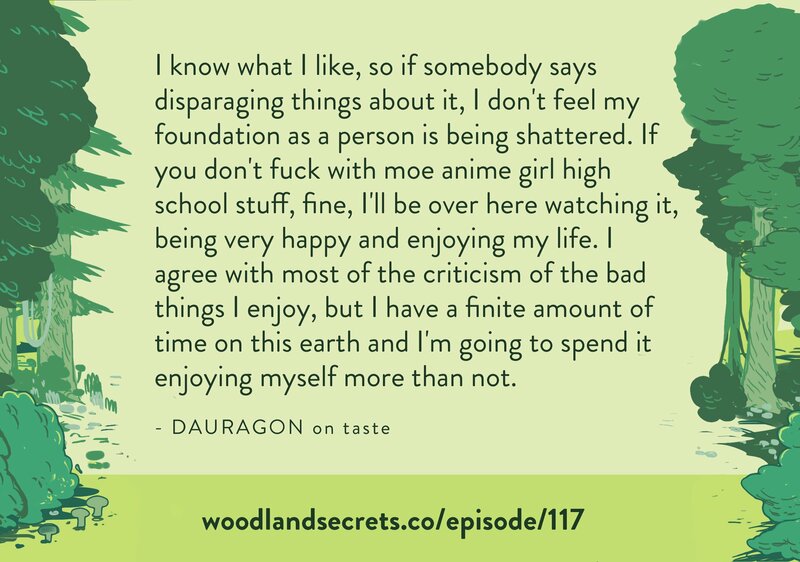 In truth… it wasn’t bad. But I never repeated it, and I had Semi-Skimmed Occultist many times during my 4 months in Edinburgh, it never stopped being excellent. After pizza and beers, I cleared out before the St Patrick’s Day crowds got large, and walked home, along familiar routes. Very little had changed in the 5 months I’d been away, just a bit of construction here and there. The true horror of the building’s sentience wasn’t that its cries for mercy weren’t heard. 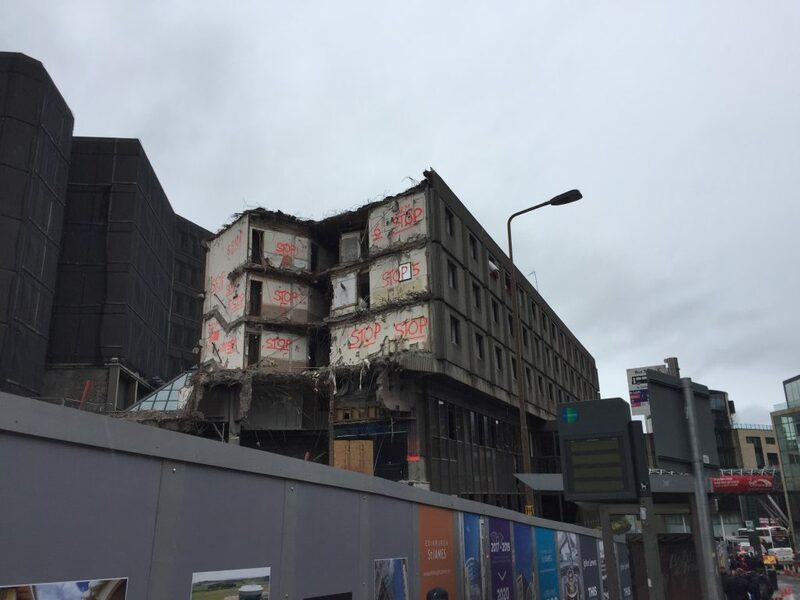 It’s that they were, but that the demolition continued anyway. Not long after I got back, Murphy and the Spaniards returned, and I got a proper tour of the place. I also got a bit of grim news. Murphy’s Airbnb listing had mentioned Melody as a co-host, Murphy’s girlfriend, who’d been living with him for about a year I think. Unfortunately, she had died within the last couple of months, in a rather unexpected and tragic fashion that I didn’t get the details about until shortly before I left. I’m not going to describe it here — it’s rather a bit personal to be dumping into a public-facing travel blog page — but Murphy was struggling. He’d canceled most of his bookings; I think I only got in because I’d booked long term and he knew he wouldn’t have to keep dealing with new people and turning over the room. He did gradually get better while I was there, but he had his good days and his bad days, and there were days when he just didn’t come down from his room, and I can’t say that I blame him. When he was around, I always found him smart, funny, and easy-going. I enjoyed his company, and I quite liked his friends also, which is always a testament to a man’s character. I even liked his dog, a frickin’ adorable German Schnauzer named Herman. I get along with dogs well enough, but I’m not really a dog person — I liked Herman instantly, though. (You’ll see pictures of him in the Airbnb listing photos.) I’ll definitely look forward to seeing them again, next time I’m in Edinburgh, if he’s still hosting. The Spanish couple staying in the other guest room were nice enough; they were moving to the UK, and Murphy had said they could stay there, for reduced rent, if they helped take care of the place. In the end, they didn’t help out as much as Murphy was hoping, and about 4 weeks after I got there he told them he was going to have to start renting out the room again and they’d have to find another place. Then another friend of his, a really delightful Italian/Turkish woman (30? maybe? ), named Ealga, needed a room closer to her new assistant manager job at a nearby cheese shop, and Murphy said she could rent the other upstairs room. So, she moved in at around the 6 weeks mark. Ealga was *great*. Smart, friendly, into video games and a bit into manga… I had a bunch of great conversations with Ealga, and she brought me a little bag of wonderful decaffeinated coffee from the coffee roasters next to the cheese shop. I need nothing more from a friend. I got to meet Murphy’s best friend since college, Giles, who works as a freelance DJ up in Aberdeen, with (I’m told) a reputation for having a huge, eclectic library of music and a knack for building playlists to match pretty much any style or theme. And Murphy’s friend Peter, an older (than me, at least) antiques dealer from London. And I met Murphy’s parents a couple of times; his mother is American (Murphy had *very* little Scottish accent, although he claims that comes more from the world-traveling he did as an engineer), and his father owns the only fish cannery in the U.K. Really. Any tinned fished that I’d find in the supermarkets, no matter the apparent labeling, actually came from Murphy’s dad’s factory in Aberdeen, and I had all the tinned fish I could eat while I was staying there, including: interesting, experimental stuff that you don’t see in the stores: Sardines in Green Thai Curry, Sardines in Red Thai Curry, Mackerel in BBQ sauce; fish I’d never heard of, like Skippers, and Sild; and sauces I’d never heard of, like Peri Peri. 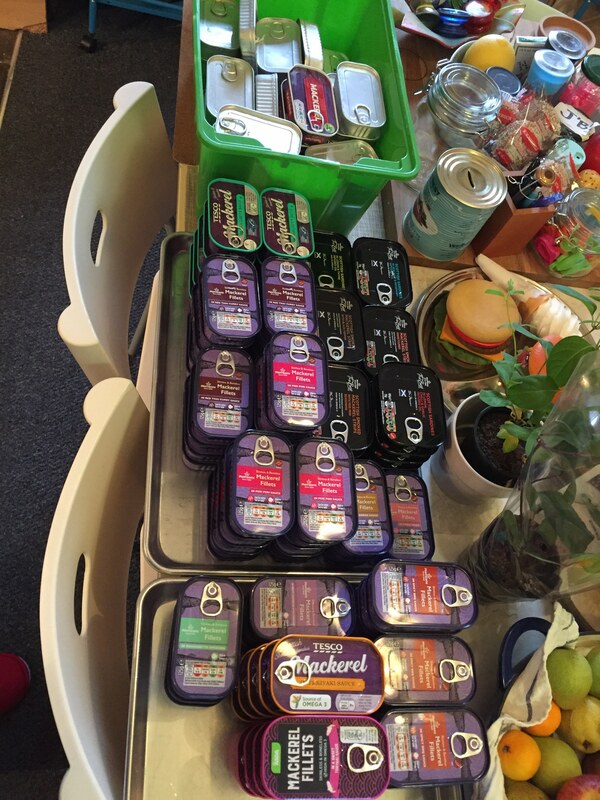 Some of the tins were labeled with various end-market packaging and descriptions, some of them were Mystery Fish, plain, unlabeled steel tins where you wouldn’t know what you were eating until you opened them. It. Was. Awesome! Or, he and his friends would propose dinner — at the unusually early hour of 9pm, out of consideration for me — and I’d think, “Ok. Sure. Let’s be sociable, it will be fun. I’ll have a snack to tide me over.” And then 9pm would come, and 9:30, and there’d be *no* sign of dinner happening anytime soon, and I’d give up, have some cheese and oat crackers, and go to bed. Other than that, there were a few points of note. One was that the water heater was a bit flaky. I’m used to bathrooms and showers being weird, and often problematic, in about 2/3 of the places I stay, but this bathroom looked wonderful and modern and up to date, a wonderful relief. Then I went to shower the first morning, and the heat wouldn’t come on. I almost cried. I wasn’t in the mood for a repeat of the daily cold showers that I’d had in Ireland last year, so I put up with being grungy and sent Murphy a message. Then, the heat came back on a bit later. Murphy explained that it was getting a bit flaky, and the 2nd or 3rd time it happened he showed me the steps needed to reset it so that it would work. I then ended up being the water heater fixer guy, resetting it regularly for myself and for guests, and meeting the boiler repair guy a couple of times. (I think he came 3 times, and it got better, but still wasn’t perfect.) Murphy later thanked me with this cool bluetooth headband, with speakers embedded in the band where they can position comfortably right over your ears, and so flat that you can sleep on your side without feeling them — perfect for wearing and playing my white noise app when I go to bed. My app plays the sound of a running creek — I set it to play for 3 hours and then slowly get softer and turn off, and it masks background noise pretty effectively. But the sound is a bit tinny and harsh through the little iPhone speakers. With this headband, it’s amazing. The sound is rich, and full, and it surrounds me; I drift off to sleep cocooned in a gentle babbling brook. (Ok, that sounds more cold and clammy than I intended. Thankfully the experience was auditory only.) I was skeptical when Murphy said he was getting me a thank you gift, because gods can I not carry anything else on my travels. But this headband is fantastic. The second point of note is that the apartment was a little close to an intersection with a busyish street, and there was a bit of traffic noise. Not normally too intrusive, but extra reason for the white noise app, especially when the weather warmed up and I had to leave the window open. (We had a bunch of warm, dry months while I was there, unusual for Scotland, and the locals were freaking out a bit over it.) The street noise only became intrusive when they started repaving the road, a month before I was to leave. They said it would take the whole month, and I groaned. But, in truth, it was only a big deal over maybe 10 days, near the beginning of the month. And for probably 9 of those days, I just let the noise pass over me, and ignored it. The other day, I got the hell out and went someplace more pleasant for a few hours until it was over. As I mentioned previously, a lot of the things I did during this visit were repeats of things I’d done in prior visits. That’s Ok, because I liked doing those things, so doing more of them was perfect. 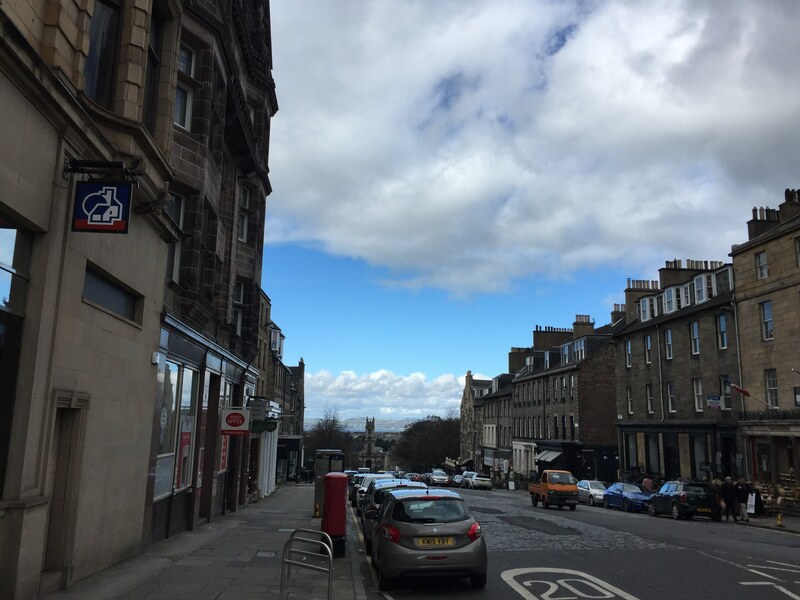 So, I’d go up to the secondary hill, with a snack or a bit of lunch, and just sit for a while and look out to the south over the suburbs south of Edinburgh, and enjoy the cool/cold breeze/wind/gale and the sun/clouds/spatter of rain, and just appreciate how great it was to be there. Looking southeast, with a bit of the Firth of Forth in the picture to the east (left). Visible in the lower left is a little dirt track, worn into the earth by a tall black guy who often showed up at around 11am and walked back and forth along that same 15′ long bit of hill for 20-25 minutes, with headphones in. We saw each other 1/2 a dozen times, and had graduated to a friendly nod by the time I had to leave. We never got to the “Hey” stage, which was a lost opportunity, but how often you never get around to saying the important things, and then one of you is gone. Over time, that walk up to the hill got easier and easier, my heart pounded less and less, and in the last 6 weeks or so I started occasionally walking up to the high point, Arthur’s Seat proper, and hanging out for 5 minutes or so, before leaving the tourists and walking down to my secondary hill. The improvement in general fitness was very gratifying. Also gratifying were the podcasts and audio books I started listening to on my walks. As much as I like feeling connected to my surroundings, there’s only so many days you can walk across what is largely the same patch of city before you start to need something to occupy your mind. I caught up on all of the Radiolab podcast (which I *highly* recommend; their episode on forests is kind of mind blowing), and Welcome to Night Vale, and then started in on Neil Gaiman’s The View From the Cheap Seats, and a collection of Lovecraft-inspired stories, and Ellen Kushner’s The Privilege of the Sword, and now I’m an audio book convert. I listen to them mostly in tiny bits, as I’m making meals, which is better for a non-fiction podcast than for an engrossing story, but boy did they make those regular walks more enjoyable. And maybe even possible — it’s hard to keep going out, knowing that you’ll see the same things every day. Having something great to listen to at the same time really turned that around. When I spent that first week in Edinburgh, a year ago, one of the places that I’d meant to get to was Calton Hill and the Nelson Monument. But there was the whole FedEx problem, and I just didn’t have time. When I came back for 6 weeks in the fall, it was firmly on my to-do list, until it got moved to my to-didn’t list, as so many things do. But this time, about 1/2-way through my stay, I made it. 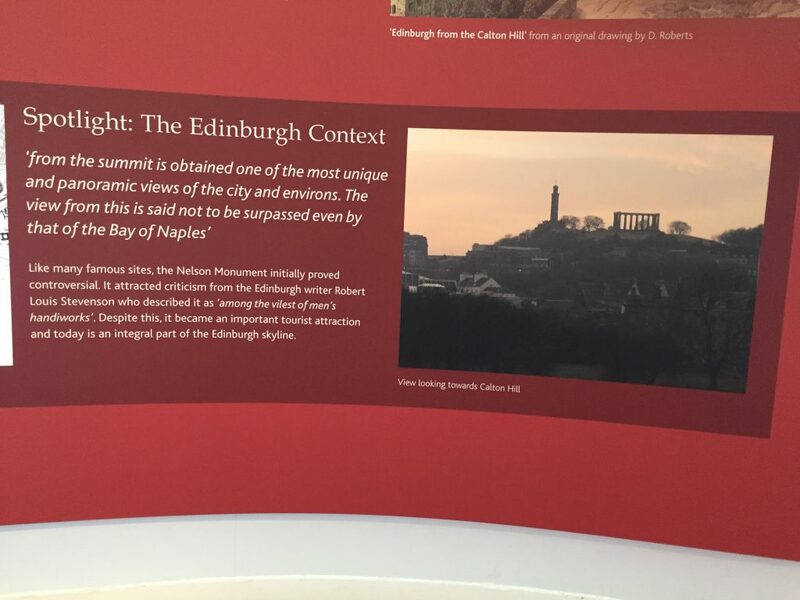 The Holy Trinity of landmarks in Edinburgh are the Castle, Arthur’s Seat, and the Calton Hill, and this plaque from the little museum inside the Nelson Monument (the tower you’ll see on the hill) has a pretty good shot of it. In truth, there’s not really much going on here. There’s the tower (the Nelson Monument), a little stand of greek columns intended to resemble the Parthenon except the money ran short (the National Monument), and a small observatory (that was closed when I was there). I can’t argue with their claim about the view though. Here’s 3 pano shots that cover the full 360° from the top of the Nelson Monument — which was a considerable climb up the narrow, circular, tower stairs, and serious wind at the top. Looking south, with the edge of the National Monument’s Greek Columns in the lower left and the edge of the Firth of Forth out to the east, Arthur’s Seat right of that to the south, all of Old Town stretching to the right, with Edinburgh Castle at the far end, Princes Street running west. Turning west, covers much the same territory, but I couldn’t stand where the other photographer was, and he looked to be there a while. But here we look out along Princes Street, with Princes Street Gardens running along it, forming the boundary between Old Town and New Town, with the West End beyond it. Looking North to the Firth of Forth. I had a bunch of trouble posting and describing those, because I cannot help flipping Edinburgh around in my head, to put the Old Town, Holyrood Park, and the Castle to the north. It’s the weirdest thing. 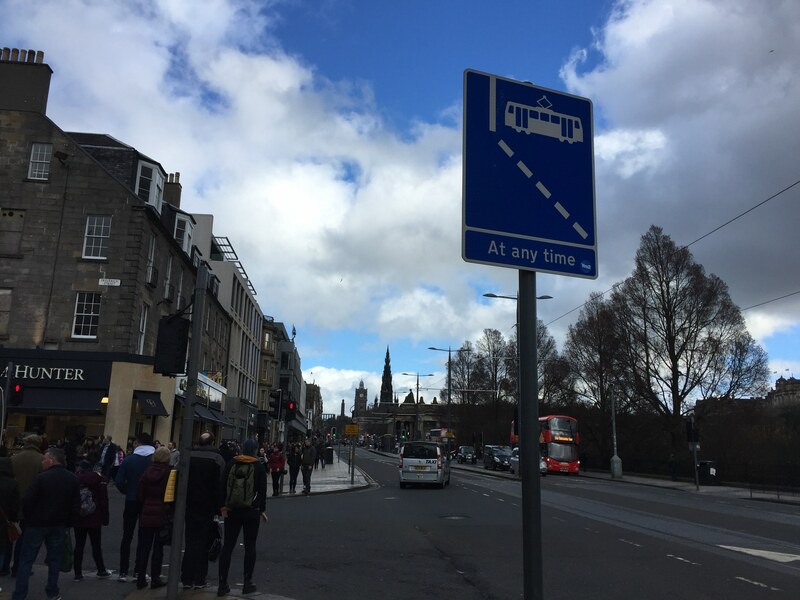 Then I start writing things like “Princes Street running east”, and catch myself later and have to start combing through the text looking for all the mirrored references. Anyway, as I said, there wasn’t really too much up here, but there were a lot of tourists showing up to see it, and I got to check it off my list. And it got me out of the house, so yaay that. Among the things that Murphy used to bug me to go to was Leith Walk, a little park and walking path the ran along the Leith River, just a few blocks south north of our place. I’d actually walked much of it south north towards the Firth of Forth, within a week of two of my arrival, but it took me until about a week before I left to walk it east west. It’s a nice longish walk, along a path through the narrow park that runs along the river. Probably super nice to have a house overlooking, and hear the sound of birds and river and small waterfalls instead of city traffic. If you keep going, you reach two art museums in fairly short order; the park continues on up the river from there, but I did not. (And Murphy claims that there is no need to.) I never did go to the two art museums, but it’s important to save something for next time, otherwise I might not be tempted to come back. And, of course, there was other, miscellaneous walking. Even walking familiar routes can lead to delightful surprises. Soul mates, unaware that their true loves were but yards away, out of sight around the corner. I have never been so torn between hating a thing and loving it. I don’t know… I like good bread too. 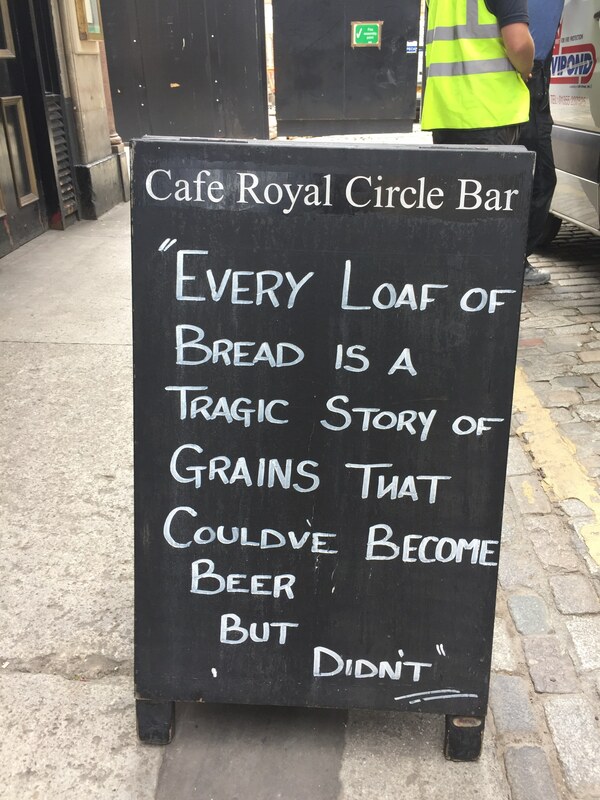 I think every grain has to find its own path in life, and we shouldn’t judge those who choose the road yeast traveled by. I took this picture because of the beautiful sky. Only looking at it later did I notice the warning sign, that the road could crumble beneath you at any time. 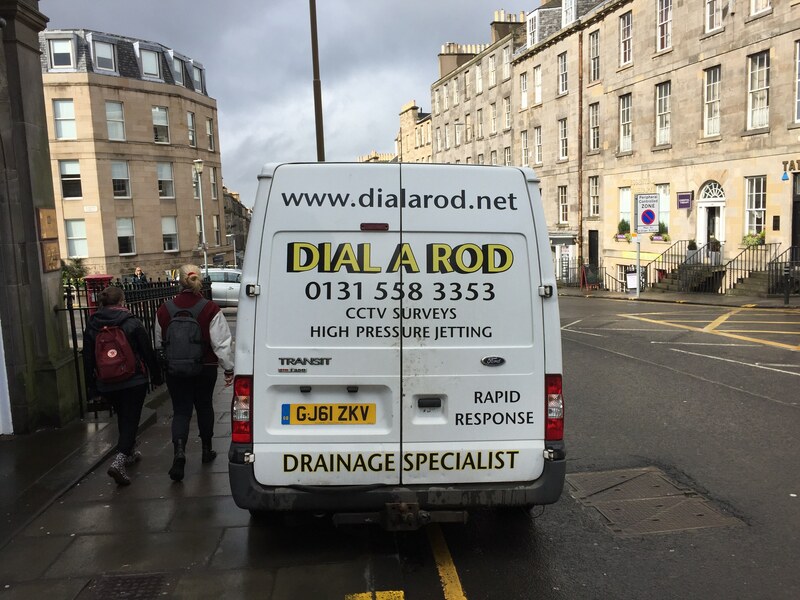 I didn’t realize that sinkholes were a big problem in Edinburgh, but kudos to the Scots for being so blasé about it. Right up until the mood swing, which is still amazing, but you might just want to hustle inside. Yeah, inside seems good. There was hail that day, as I recall. But, as I mentioned, the weather while I was there was comparatively warm and sunny most of the time. A view looking south east towards Old Town, next to the National Gallery between Old Town and New Town. 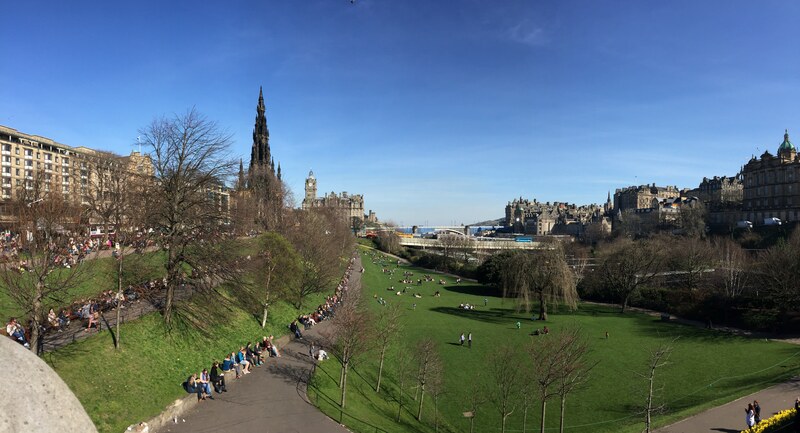 Or, from a few feet away, the view over Princes Street Gardens. I mean, my gods! After 4 months there, I was really feeling like it was proper to move on to the next place. But now I’m wishing I’d written all this before I left, because browsing these pictures is making me homesick. Of course, they had hail in Glasgow just yesterday, so who knows how long this good weather held up after I left. I went back to the National Museum a few times. It was free, and they had restrooms. Also, a decent cafe that wasn’t terribly expensive. (And a serious restaurant, with a view, that was more so, but I went there last time.) 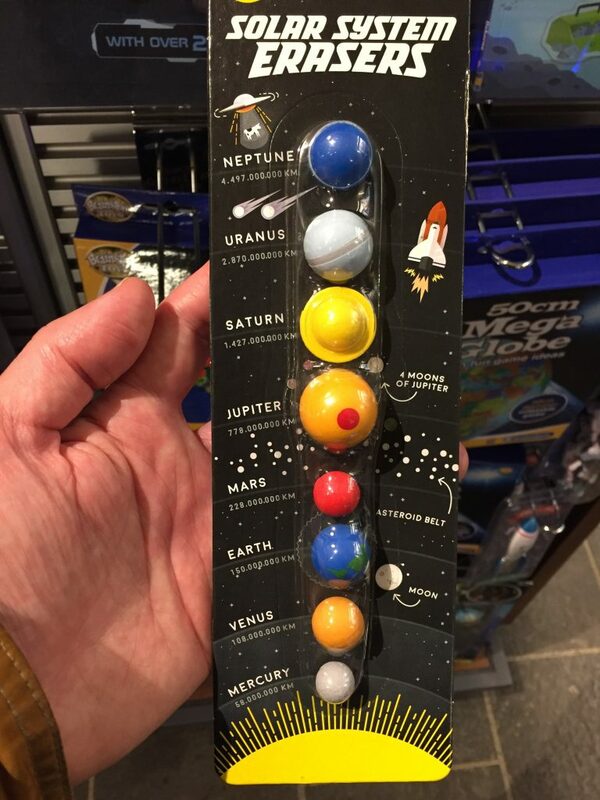 I kept swinging by the gift shop, thinking that I’d find a cool scarf or pin or something, but no such luck. One of my crowns came loose, and I had to find a local dentist to re-affix it. Murphy suggested someone a bit over an hour’s walk away across the heart of the city, and they were able to see me almost immediately. Delightful people, and much perturbed about the unseasonable weather. I confessed that it was my fault; I love the rain, and wherever I go, it mostly stops until I leave. California? Droughts. I leave? Rains and flooding. Rainy Thailand? Here, let me fix that for you. Boom! Instant drought conditions. Southern Ireland? Unseasonably warm and sunny while I was there. Edinburgh? The same. Now I’m in London, and today was sunny and 82°. I think next year I should look into submarine rentals. It’s the only option left, if I want water above me on any kind of regular basis. My long standing allergy to any kind of denim other than black Levi’s 505s got worse. And I’m not kidding here — for 10 years, wearing any other denim starts to make my skin raw and irritated and progressively worse until — well, I have to stop wearing them before I do damage. Except for black Levi’s 505s. I have no idea why they’re different, but ended up owning 8 pair, 7 of which are buried in a storage container in Washington state. But the 8th pair, that I’ve been wearing every day for the last 18 months of European travel, finally wore out. So I ordered a new pair (with some difficulty, because of weird English textile import rules) and, within 3 weeks of wearing them, the reaction started. My best guess is that they’re using a new dye now, more similar to the dye used on their other jeans, and that’s what I’m reacting to. I thought maybe I’d been able to fix the reaction using some holistic stuff, but instead I’ve just changed it: now, wearing them for even a day gives me massive headaches — the last one, last week, took me nearly a week to recover from. (Part of the reason I kept playing Elder Scrolls Online after the event was over last week; I didn’t at all feel like going out. Or thinking too hard.) So that’s crazy annoying. ☹️ I’ve found a pair of heavy cloth pants that aren’t denim, but should still be good for cooler weather, and I’ve given the 505s to a local thrift shop, but I’ll miss them. They were sooo comfy, like good jeans are supposed to be. At least, in a few years, I’ll unpack my storage container in a new home and my good, old-make jeans will be waiting for me. Something to look forward to in my old age. I saw Guardians of the Galaxy 2 when it came out, a week earlier here than in the U.S. A super fun movie — maybe I liked #1 a bit more, but you can’t go wrong with Kurt Russell playing an insane, sentient planet. The new Spider-Man: Homecoming, out now, was fantastic. Witty, and fun, and very new in style and tone from the prior movies, much more similar to a modern Marvel movie than the previous renditions. Perhaps the best portrayal of Peter Parker as a smart but impulsive 15 year old who gets super powers dropped in his lap and has to try to learn the ropes, getting in way over his head most of the time. The previous Peters were all basically young adults. Not that I’m complaining about them; to my mind, Spider-Man 2 may be the best superhero movie ever made. But they were still darker, more mature movies. This one is light and energetic and fun. And it has Michael Keaton, who is amazing, playing a really good role really well. The new season of Sense8 came and went and was (mostly) brilliant. My friend Jenni gave me sooooo much grief for not finishing the whole 11 episode series the weekend that it came out, OMG, you have no idea. And then Netflix canceled it, cutting away the option for a season 3, and leaving us with more than a few cliffhangers unresolved. And then they agreed to a 2-hour wrap up movie. So, we’ll see where that goes. And then Neil Gaiman’s American Gods TV adaptation came out, and it was amaaaazing! That, I binged-watched all in one day (8 episodes, just doable), once the season wrapped up. It aired as weekly episodes on Starz and was available on Amazon with a Starz subscription. But I plan to buy the series, and I’m *not* paying Starz twice: 2-3 months of subscription fees while it’s airing, and then a second time to own it when it’s released. So, I waited until it was complete, subscribed for the free trial, and the canceled after I watched it. Which I wouldn’t normally do, but I’m totally buying it from them when they’ll sell it to me. Anyway, it’s a genius adaptation of the novel, and I highly recommend it. Let this stand in for all the things that I didn’t do. 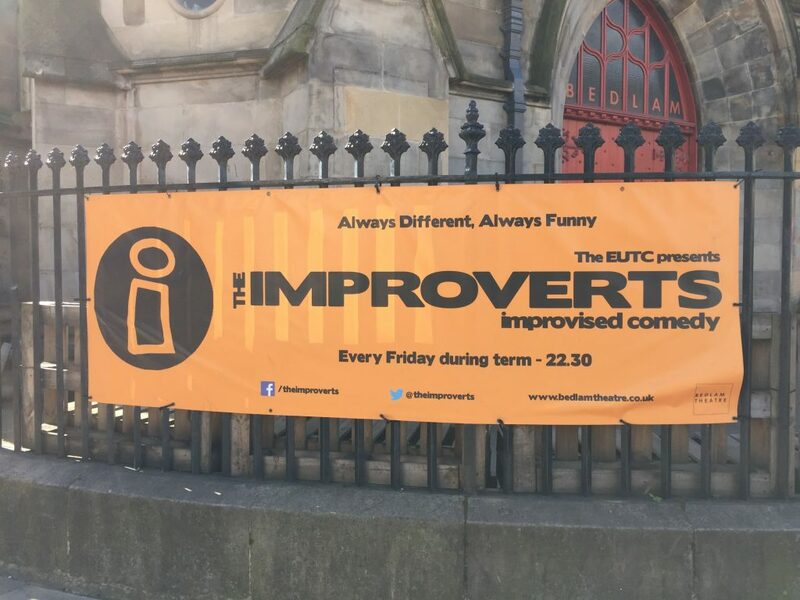 An improv comedy show! I would totally go to that, if they had it at, say, 1:30 pm. Maybe — maaaaybeee…. — even at 6:30 pm. But 10:30 pm? Nuh uh, no way. If this was 1985, and the only way to get entertainment outside of books and telly was to go to live shows, so you went whenever they chose to put them on, sure. But 2017? I have hundreds of hours of entertainment that I’ve ripped or recorded and not even watched yet, not to mention the countless thousands I could stream. You think I’m going across the city to watch a show that may or may not be any good and doesn’t even start until 10:30? Ha ha ha ha ha ha, you’re funny! Yeah, no. 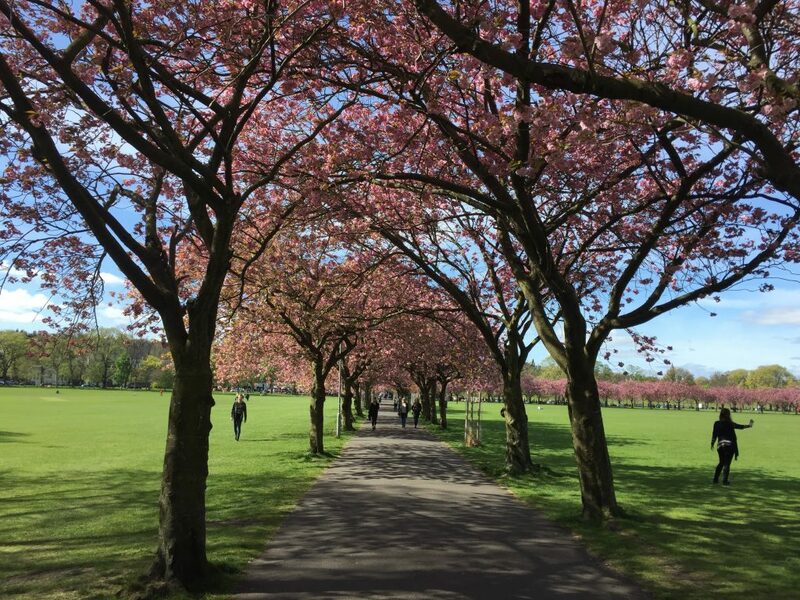 One last Edinburgh image: Cherry Blossom Season! 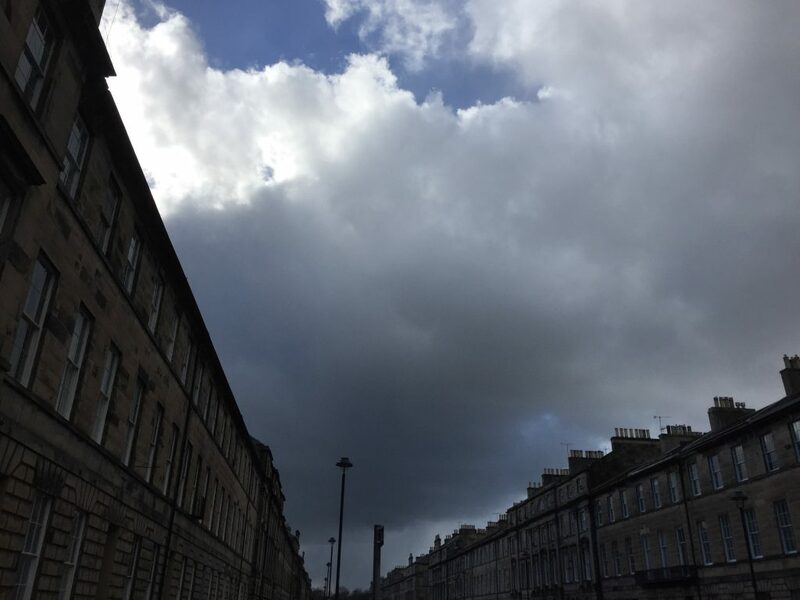 This entry was posted in Uncategorized and tagged American Gods, Arthur's Seat, Brew Dog, Calton Hill, Caravaggio, Edinburgh, Fallout 1, fish, Guardians of the Galaxy, Holyrood Park, Leith Walk, Levi's 505, Murphy, Nanny State, Nelson Monument, Semi-Skimmed Occultist, Sense8, Spider-Man. Bookmark the permalink.